At first, Bob Stenger really didn’t know what he was doing. All he had in mind was to build a golf hole for some fun, on pasture land he’d bought from his father outside Milton. The Stenger family is busy with their new project, the Shamrock Par 3 near Milton. 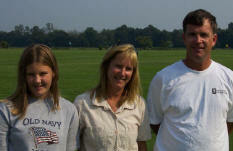 Shown above (l-r) standing near the 9th green are Shelby, Wendy, and Bob Stenger. Shelby’s sister, Taylor, is missing from the photo. After a while, Stenger built a couple more holes. Then it snowballed. Eventually Stenger and his new bride Wendy completed an entire 18-hole layout, spread throughout 25 acres of open field. The owners of Shamrock Farms Par 3 on Saw Mill Road celebrated their first full year of operations in July, and discussed their new venture in a recent interview. Stenger said opening the course to the public took a bit longer than expected, largely because he didn’t realize the time it would take to obtain all the necessary permits. 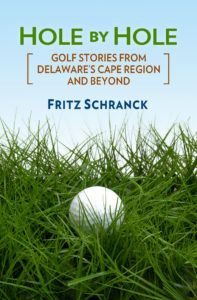 On the other hand, he drew upon his experience as the manager of the Rehoboth Beach sewage treatment plant for many of the critical systems needed for the golf course’s success. “I know something about moving water,” he grinned. Wendy and Bob share all aspects of managing their operation. It takes about 4 hours to cut all the rough, and a few hours each to cut the fairways and greens. The layout is wide-open, with a few Leyland cypress sprinkled about. The holes vary in length from 74 to 144 yards, running in four directions. Golfers will find themselves playing with the breeze, into the breeze, and dealing with its effects from both the left and right sides. A sand trap is to the right of the 13th hole, with woods guarding the left side of that hole. Over the winter, Bob plans to add a few more hazards to the course. Just inside the woods along the 14th hole is an old manger that the cows and sheep once used. Wendy said golfers now use it as a handy rain shelter. The fifth hole is perhaps the most intriguing, a 113-yarder with a small peach tree perched a few yards in front of the hole. The tree forces a high shot into a green that slopes from front to back. It’s a good challenge for golfers at any skill level. The greens are relatively small, circular, and feature some very nice-looking turf. High approach shots will hold, and putts run smoothly. The course would be a great place for kids and others to learn the basics of the game, without wearing themselves out trying to play a full-sized course. Wendy said that more-experienced players also tell them that the course is great for short-game practice. I can tell you that with the small greens, any slight errors in direction give players several opportunities to work on their chipping—not that there’s anything wrong with that. Wendy said they held a night golf tournament in July, and the response was good enough for them to schedule another one for October. “It was well-received—we had 64 players, with glow sticks set in straight lines from the tee boxes to the greens. The flags also had glow sticks, and there were others put into each hole. It became really quiet while they were playing, and it looked a bit like a model village. The balls flying through the air looked like shooting stars,” Wendy said. For more information about Shamrock Farms, call 684-1808, but be patient. The Stengers might be outside on their tractors. The Northeast Section of the LPGA Teaching and Club Professionals Division is playing a pro-am tournament at Baywood Greens on Monday, September 13. Long Neck resident William P. Haughey, Jr. is the tournament director, and he’s pleased to be involved in bringing an LPGA event to the Cape Region. Baywood Greens and the LPGA hope to develop a long-term relationship from this start. You can play a round with some of the country’s best women golfers for a tournament entry fee of $125. Group sponsorships are available for threesomes, and sponsorship tee signs are also available. For more information call Baywood head golf pro Brian Barrows at 947-3800.